In response to incidents of domestic, gender-based violence and associated condonement by authorities in Armenia, the Armenian Youth Federation-Western United State (AYF-WUS) released the “End Violence Against Women” t-shirt. 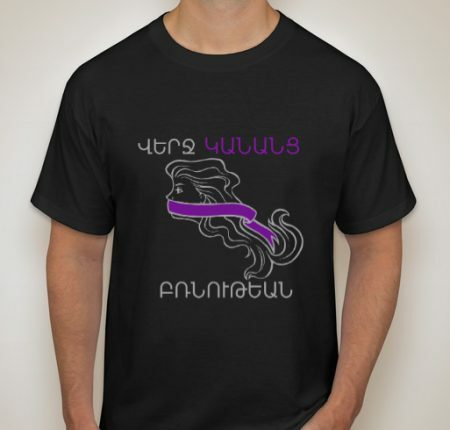 All funds raised from sales will be sent to organizations working to raise awareness and take action on gender-based violence and inequality in Armenia: Women’s Support Center and Society Without Violence. The fundraiser is a part of the AYF-WUS United Human Rights Council’s “Project Ser”, a campaign that strives to make gender equality and inclusivity a reality and a practice in communities and organizing spaces. For more information on the Women’s Support Center, please visit: http://www.womensupportcenter.org. I love my shirt. Thank you for organizing this, Armenian youth!